Having a home of your own with customized changing in it is really a dream. You plan your whole life how will be the rooms, what type of floor you will have, what kind of kitchen counter will be and how will you design your exterior. 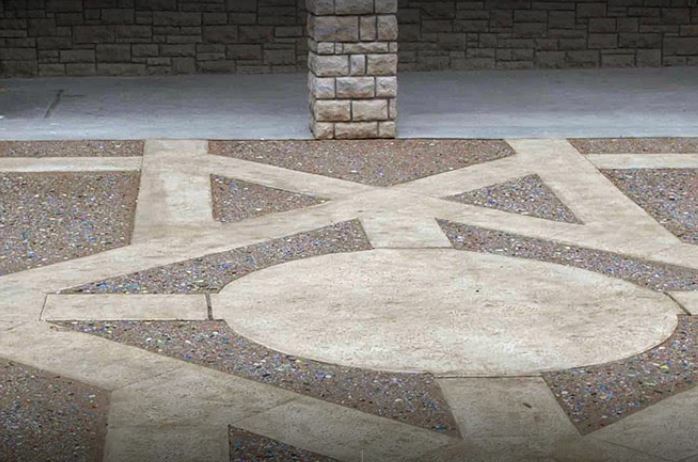 With Nashville Stamped Concrete, we make it easier to decide your concrete flooring style and other decorative flooring services. Why do you need to change your floors? If you are the one who hates to vacuum your carpet daily or hates messy floors, you really need to change your floors. Cleaning a carpet is really messy. It requires a pretty good time to vacuum all the rooms, clean those dirty marks (which are not really cleaned even though whatever you try) and let water spill dry! Carpets have always been a problem for all of the homeowners. You also need to replace them after a few years when they become so messy and dirty that there is simply no use of vacuuming them. The result is you dump them somewhere creative a more havoc to a green environment. Similar is the case with the wood floors. They get scratches easily and do not tolerate heavy foot traffic. To mend a wooden floor requires more money as compared to stamped concrete floors. If you are a truly green environment person, you will always be hesitated to use wood as a material of your floors. In order to get rid of these issues which will continuously bother you and to have a long-term permanent solution, we offer you to have stamped concrete floors in your home. 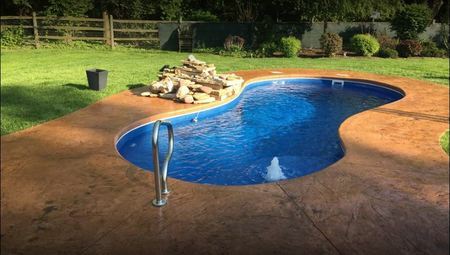 Nashville Stamped Concrete is a professional company offering its services to the residents of Nashville and its suburbs. Being in the field of many years has enabled us to prove ourselves the best in town. It is due to our excellent flooring services that we are having thousands of satisfied customers on board. There are different benefits of these flooring services which you can enjoy for a longer term. There are a lot of patterns provided by us to choose from. You can simply select the pattern and let us know. This technique saves you a lot of money and time. Stained concrete flooring can save you from getting expensive decorative patterns from the market. 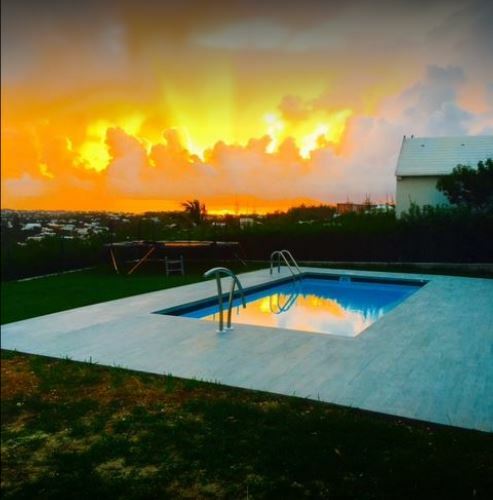 By staining techniques offered from our expert stamped concrete contractors, you can enjoy a stain of your choice with a very cheap amount. Epoxy flooring with Nashville Stamped Concrete can give your floors a professional and aesthetic look. They are not only able to survive under heavy traffic and load but are also non-combustible. Hence, also used in different experimental labs and pharmaceuticals. Our industrial and commercial customers always prefer to have Epoxy floors in their buildings because heavy machines are used in such areas and epoxy floors are the hardest surviving concrete flooring ever. Industrial experiments also have different types of chemical, resins or greasy spills. By having epoxy floors the floor is not affected at all and is easily cleaned with a mop! When we talk about the décor of a home we want everything to be perfect. From porch to patios, kitchen counters, walls, outdoor kitchens, sidewalks, garages, etc everything needs to be aesthetically beautiful. In order to achieve such a beauty in the form of marble, concrete, wooden pattern, acid-stain, you need to get benefit from our decorative concrete flooring service. 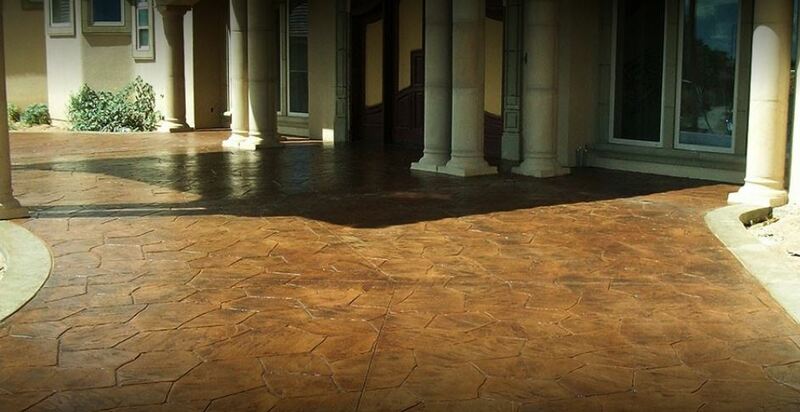 Decorative concrete flooring gives a look to your home which every other guest will praise. You can don’t need to change your concrete floors because they have a lifespan of 25 years! We know how to value our customers and how important it is to give them the look which they desire. That is why; we offer additional perks to our customers. If your house is under construction or you want to change your existing floors, you can enjoy our quality services easily. We give a free survey to your site to guide you well about the process. We offer very reasonable on-site quotes to our customers. We work with environmentally friendly chemicals, resins, hardeners, and polishers. We are always completing our work on a promised time! Our customer care is available 24/7 for you. We leave your place with a zero mess strategy. All the mess created during the flooring process will be cleaned by us. We always work on a zero damage policy. Your property will always be safe with us and our expert team will never damage it. Finding a stamped concrete contractor in Nashville, TN? You know the right place! Call us now and book your appointment! Nashville is a city in Tennessee which is rich in its historical culture. It is not only the city of many museums, art galleries but also historical music. If you ever happen to visit Nashville, TN there are certain places you should never visit. These places are loved by tourists of all kind and are highly rated. You will leave Nashville with good memories, a mobile full of pictures and a trip worth to remember! Nothing is better than starting your visit from an auditorium which is one of a kind. The visiting hours are 9 a.m. to 4 p.m. daily and the charges also depend on the ages of the tourists. You can also have a guided backstage tour to know more about different acts happening there. However, if you want to enjoy at your fullest, you need to know about the latest concerts or shows happening in this auditorium. The crowd and types of acts will always leave you amazed! If you want to treat a country music fan that is on a tour to Nashville with you, this is the best place for him. It's really a wonder to see history and music fused together to give an aesthetic look. You can also see different artifacts along with Jimmie Rodger's guitar and Elvis Presley's solid gold limo! You can also have a special tour to Studio B where world's best record-breaking gold and the platinum record is present. If you want to have a good picnic along with friends or family this is the best place to do! Nashville is also called “Athens of South” due to many educational institutes working here. It’s called Athens of South due to a magnificent building which is the replica of the one in Athens, Greece. This is called Parthenon and the structure, statues, aesthetic; everything will take you to Greece! The grounds and greenery around are breathtaking. The view becomes more appealing at night when the Parthenon is lit with so many attractive lights. Your visit to Nashville is incomplete if you have not seen Grand Ole Opry. It is a place of great performers with a rich history of music. The guides are very energetic and fun loving. They will not only guide you about the building but will entertain with different fun facts about it. You can avail different types of tours here depending upon your interest and budget. These tours are daytime backstage tour, post-show tour and a VIP tour. ​Let your memories flood yourself throughout your life by visiting the Johnny Cash Museum. This museum is endorsed by Cash family itself and is a place for all the artifacts, letters, records, costumes and many things used by Johnny Cash himself. People who are a die hard fan of Johnny Cash can get a chance to know his personal, professional and private life. The guides there can introduce you to different facts and you can enjoy a great deal of time. Nashville, Tennessee is full of exciting and memorable places. You can choose from a variety of restaurants, clubs, parks, museums, historical buildings and much more! Planning soon to visit here? Don't forget to visit these famous places! We are all over the web, click here!